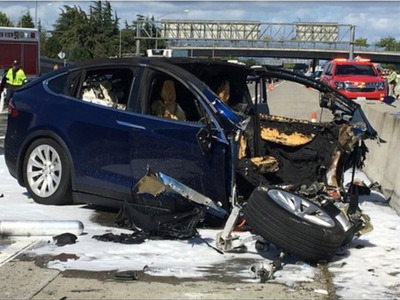 KTVU via Associated PressThe Tesla Model X that crashed into a highway barrier speed up before the collision, according to a new report from the NTSB. On Thursday, the National Transportation Safety Board revealed new information about the fatal accident from March involving a TeslaModel X and its semi-autonomous Autopilot feature. As the vehicle approached an area where two lanes diverged and became separated by a highway barrier, the vehicle moved to the left and drove on a path that would lead it directly into the barrier’s crash attenuator – which is designed to limit the impact from collisions – which had been damaged in another collision less than two weeks earlier. Autopilot has become a point of controversy for Tesla in recent months, as crashes involving the feature have raised questions about whether drivers place too much trust in it and fail to pay attention to the road.Tesla has repeatedly said Autopilot is meant to be used with an attentive driver whose hands are on the wheel.